This 142-page volume cookbook was published in 2009 and contains 75 recipes, which were developed just for the National Heart Lung and Blood Institute NHLBI. 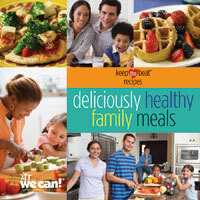 This unique cookbook is centered around family-friendly meals and snacks for children and adults. Beyond a wide variety of tasty and healthy dinners, the book also provides valuable information on cooking practices and nutrition. Last, not least it also covers information on feeding children and those who are picky eaters. This 128-page cookbook was published in 2010 and contains 40 recipes, which were developed just for the National Heart Lung and Blood Institute NHLBI. 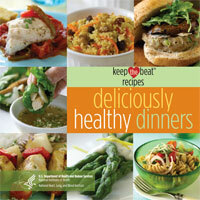 This handy cookbook was designed to help busy parents who want to keep meal preparation a family affair. The cookbook was created especially for the NHLBI by a Culinary Institute of America-trained chef/instructor and father of two. The recipes were tested with parents and school-aged children to make sure they liked them.